It would be easy to assume that all VPNs are created equal, and to a certain extend you would be correct, but they are not. Even if you were to glance at the many VPN related websites, including IPVanish, you wouldn’t notice much of a difference between VPN providers. A good question to ask yourself is: What do I really need? The answer comes down to either speed or privacy or both; needless to say, it would help if the VPN will work with all of your devices. You might wonder why I haven’t mentioned price? Simple, most VPNs cost about the same give or take a few dollars per year, but I’ll mentioned it in the details further down. What do you really need to know about IPVanish? IPVanish has been around for a while and offers a solid product. In contrast to many VPNs they own their own network, hence provide plenty of speed. They have apps for most devices and the help section of their website has detailed instructions in case you want to, or need to, install IPVanish manually. IPVanish costs USD 77.99/year, but you are welcome to pay more. One of the key questions to ask is, will it work on the devices I want to use it on? IPVanish has apps for Windows, MacOS, iPhone, Android, FireTV, Windows Phone, Linux, Chromebook and many routers. If your device isn’t on the list, chances are you’ll be able to find setup instructions on their Help pages. Closely linked is the question of which protocol(s) you can use. 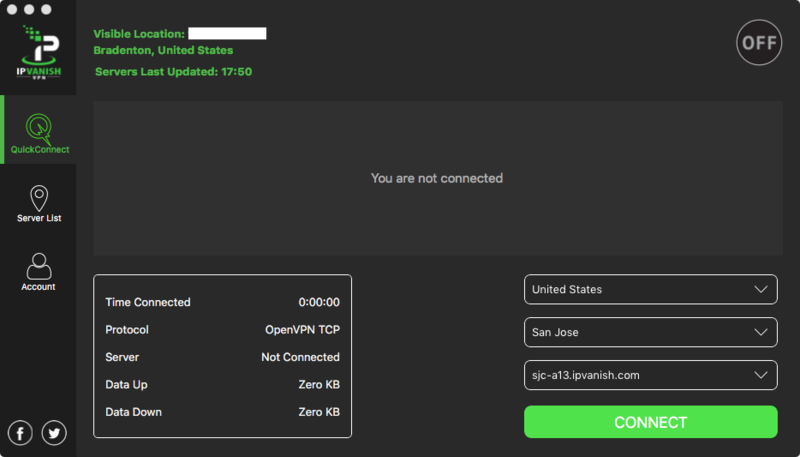 IPVanish offers a variety of protocols to choose from, OpenVPN, L2PT, IPSec, PPTP, and IKEv2 to establish a secure connection. You may also use SOCKS5 if you wish to only mask your IP address without the need for encryption. While VPN service has gotten cheaper over the years the going rate is around USD 70/year as of this writing, give or take a few dollars. IPVanish has 3 pricing plans, all of which give you the exact same features, meaning it all comes down to price. Their months-to-months plan costs USD 10/month supposedly saving you 17% of a price you wouldn’t be able to pay in the first place, hence no savings. The 3 months plan costs USD 8.99/month billed as USD 26.99 every 3 months and the yearly rate is USD 6.49/month billed as USD 77.99/year. Setup is easy. After signing up for IPVanish you simply download the app for your device, install it, enter your username and password and you are good to go. Of course, you can install things manually if you wish or may have to, if your device doesn’t have a corresponding app. IPVanish has more than 1000 servers located in many countries around the world and they keep adding more, so chances are they have you covered. Server location is important for 2 reasons, because distance between you and the VPN server impacts the speed you can expect from a VPN service and second if you are planning to circumvent region restrictions you need a server in the location you want to appear local at. IPVanish uses AES–256, the governments own encryption standard. AES stands for Advanced Encryption Standard, 256 stands for the cypher’s length. While the government, in particular the NSA, obviously won’t comment on its ability to break AES, it still requires this cyber for all top secret communication. Even after the Snowden revelations, there is no reason to suspect the NSA has cracked AES–256. It is more likely that they target the implementation thereof. I have used and tested IPVanish for years and haven’t had any problems with its speed. 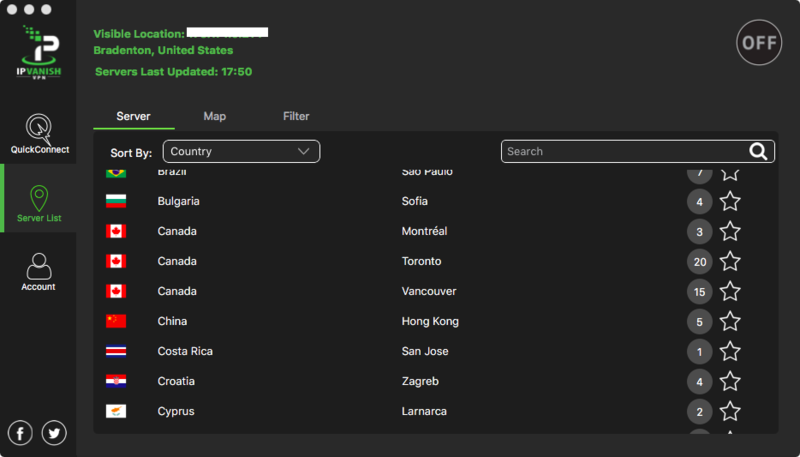 I always perform speed tests using speedtest.net and while connecting to any VPN will decrease your internet speed, in most cases I was able to stream Netflix, Hulu, Pandora etc… without problems. I would encourage you to use IPVanishes 7 day money-back guarantee to test speed for yourself to make sure the service performs as expected in the places and situations you want to use it in. IPVanish advertises 24/7 support. You should know however, that while their support system probably is online 24/7/365 that does not mean that you will get your questions answered 24/7. In fact even a simple response can take days beyond the useless auto-responder. So if you are the type of person who needs support, please do not set your hopes too high! Please note that IPVanish’s terms clearly state that they have a 7-day refund policy and that your request for a refund has to be made within 7 days of purchase or will not be honored. The aspect of primary importance to VPN users is IPVanish’s strict no logging policy, meaning when you use their VPN they will not log any information about your usage, with the exception of maybe statistical information to troubleshoot app crashes. What makes IPVanish stand out is that they own their own network, allowing IPVanish to offer plenty of speed and some to spare, so you can enjoy high throughput and actually enjoy that movie you always wanted to watch. Installing IPVanish on most devices is point and click and you’ll be up and running and won’t be needing any support. They allow anonymous torrenting and P2P traffic and up to 10 simultaneous connections, so one account per family should suffice. I wouldn’t count on the no-logging policy, but you shouldn’t be planning to do something illegal in the first place. If you are still unsure if IPVanish is the right choice for you, make use of their 7-day free trial to try it out for yourself with your devices and where you are planning to use the service; that way you’ll know for sure if IPVanish is the provider for you before signing up for the yearly plan to save some bucks! Thank you for reading. We’d love to hear how IPVanish is working for you, so please comment below!